James Corden hosted the ceremony for the first time. The "pre-telecast" ceremony (officially named The Premiere Ceremony) was held on the same day prior to the main event and was hosted by comedian Margaret Cho. Performers adapted from International Business Times. Skip Marley "Chained to the Rhythm"
Gary Clark Jr. "Born Under a Bad Sign"
Lady Gaga "Moth into Flame"
The Dap-Kings "All Around You"
O'Connor Band - "Ruby, Are You Mad At Your Man?" Ravi Coltrane and Third Coast Percussion - "Mallet Quartet"
Northern Cree and Carla Morrison - "Cree Cuttin'"/"Un Beso"
Taken from the Grammys website. Listen – Tim Bowman, Jr.
"Bridge of Spies (End Title)"
"The Expensive Train Set (An Epic Sarahnade for Big Band)"
"L'Ultima Diligenza Di Red Rock – Verisione Integrale"
"Somewhere (Dirty Blvd) (Extended Version)"
In June 2016, the Grammy organization announced a few minor changes to the voting and awarding process. As of 2017, recordings released solely through streaming services will be eligible to enter the award process. These recordings will have to be available through streaming platforms. Applicable streaming services are paid subscription, full catalog, on-demand streaming/limited download platforms that have existed as such within the United States for at least one full year as of the submission deadline. All recordings entered must have an assigned International Standard Recording Code (ISRC). It means a return to the situation prior to 2012, the year the categories were merged in a major overhaul. The Best Rap/Sung Collaboration category (in the Rap field) will be renamed as Best Rap/Sung Performance, to allow solo performances, a result of "the current state and future trajectory of rap by expanding the category beyond collaborations between rappers and vocalists to include recordings by a solo artist who blurs the lines between rapping and singing." 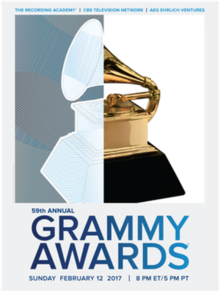 ^ a b "The Recording Academy Announces Rule Amendments and Dates for the 59Th Annual Grammy Awards Process". Grammy.org. Retrieved 13 February 2017. ^ "THE RECORDING ACADEMY® AND CBS EXTEND AGREEMENT TO BROADCAST THE GRAMMY AWARDS® THROUGH 2026". Grammy.org. Retrieved 13 February 2017. ^ Daniel, Holloway; Maureen, Ryan (November 22, 2016). "James Corden to Host Grammy Awards (EXCLUSIVE)". Variety. Retrieved November 30, 2016. ^ "TUNE IN: MARGARET CHO TO HOST GRAMMY PREMIERE CEREMONY". The GRAMMYs. Retrieved February 12, 2017. ^ Johnston, Maura (6 December 2016). "Grammy nominations 2017: Beyoncé and R&B artists shine while rock suffers". Guardian. Retrieved 7 December 2016. ^ Unterberger, Andrew (6 December 2016). "Here Is the Complete List of Nominees for the 2017 Grammys". Billboard. Retrieved 28 December 2016. ^ "FINAL NOMINATIONS LIST" (PDF). The GRAMMYs. Archived from the original (PDF) on 20 December 2016. Retrieved 28 December 2016. ^ "59th Annual GRAMMY Awards Winners & Nominees". Archived from the original on 13 February 2017. Retrieved 13 February 2017. ^ "9 times women made grammy history". [Grammy.com]. ^ "Grammy Awards 2017: See the Full Winners List". Billboard. February 12, 2017. Retrieved March 1, 2017. ^ Sharma, Dishya (February 12, 2017). "Grammys 2017 Live Update". International Business Times. Retrieved February 12, 2017. ^ "The 59th Grammys: performances, winners and red carpet looks – as it happened". Guardian. 13 February 2017. Retrieved 20 February 2017. ^ Shaheem Reid (February 13, 2017). "Grammys 2017: Chance the Rapper, Kirk Franklin and gospel choir take audience to church". REVOLT. Retrieved April 26, 2017. ^ "Who's Performing At The GRAMMYs? From Adele To The Weeknd: Here's The Official Performer And Presenter List". Grammy.com. 11 February 2017. Retrieved 13 February 2017. ^ "Watch: 59th GRAMMY Awards Premiere Ceremony". Grammy.ciom. 12 February 2017. Retrieved 1 August 2017. ^ "59th Annual GRAMMY Awards Winners & Nominees". The GRAMMYs. Archived from the original on 13 February 2017. Retrieved 24 January 2017. ^ Dionne, Zach. "JOHN LEGEND & CYNTHIA ERIVO SING 'GOD ONLY KNOWS' FOR GORGEOUS GRAMMYS IN MEMORIAM". Fuse.tv. ^ "GRAMMY In Memoriam: honoring those we lost in 2016". The Recording Academy.